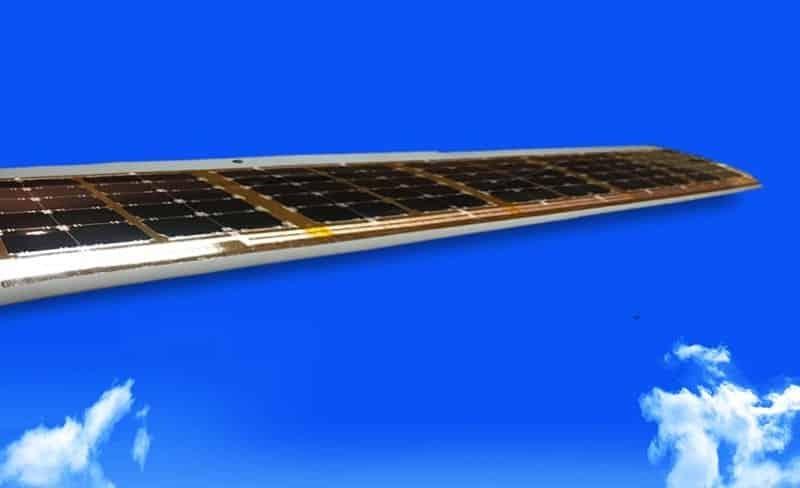 SolAero Technologies Corp (SolAero) has announced the completion and delivery of the first solar wing for Bye Aerospace‘s “StratoAirNet”, a solar-electric unmanned aerial vehicle (UAV). SolAero is integrating their advanced high-efficiency solar cell technologies on the graphite composite StratoAirNet wing using proprietary methods to maintain the critical laminar flow surface on the wing. The initial wing-solar cell configuration will deliver sufficient power, approximately 2,000 Watts, under ideal daylight conditions at altitude, to achieve sustained flight of the StratoAirNet solar-electric UAV. The Bye Aerospace “StratoAirNet” family of “atmospheric satellites” is intended to provide support for commercial and government security requirements. The SolAero and Bye engineering teams have worked collaboratively to accomplish this milestone event. The initial medium-altitude StratoAirNet 15 proof-of-concept prototype is nearing completion and undergoing final assembly. Final assembly and integration of the wings and power systems integration of the 15-meter wing span solar-powered StratoAirNet are planned to begin in November 2017, with ground and flight tests to follow from their new facility at the Northern Colorado Regional Airport near Loveland and Ft Collins, Colorado.